Family:parents, Mark and Jeannie Jo and brother, Kody, 10. School:Eric is a Freshman at Soroco High School and Jace is a 6th grader at Soroco Middle School. What is your future in the sport of rodeo? Where would you like to see it go?Jace: I want to continue to team rope and start tie down roping. Eric: I would like to pro rodeo and make it to the NFR in team roping and tie down. What is your ultimate goal as you continue competing in rodeos?Jace: To keep working hard and win more world titles in the National Little Britches, High school rodeo and eventually go to the NFR. Eric: To continue to get better and win. Favorite aspect of rodeo:Jace: My favorite part is the competition. Eric: Being able to do what I love. 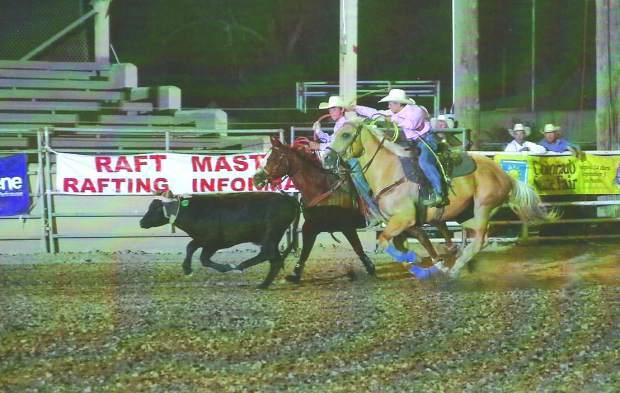 Best rodeo memory: Winning the short go round with an 8 second run at the 2012 NLBRA Finals. Winning the World! Notable achievements in the sport:Won the 2012 World Championship in Dally Ribbon Roping together as a brother team. Came in to the short go in 7th place, won the round with a time of 8.93 and won the world. 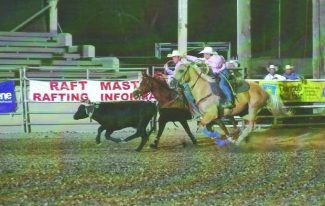 Tell us about your horse(s): Eric and Jace qualified for the 2012 NLBRA Finals in team roping and dally ribbon roping together as a team. They both were riding horses that the family bred and raised. Justa Smart Lil Doc aka: Justy has been Eric's main horse for the last couple of years. She is a natural athlete and competitor. Eric and Justy make an awesome team in the arena and on the ranch. She stays calm and cool and knows what her job is. She makes it easy to compete and keeps everyone's nerves in check. My mom also rode her to two all-around Adult Gymkhna championships when she was 6 and 7 years old. Jace and Skeeter have been the headers in the roping team. Little Golden Lena aka: Skeeter was born on Eric's birthday and comes from an incredible breeding combination. The sire of both Justy and Skeeter is our family's stud horse, Docs Sugar Catalyst or commonly known to us as Doc. Doc is a grandson of Smart Little Lena and has been an incredible horse to own. Skeeter along with Justy is one of our top picks for being used in the arena or on the ranch. Justy was originally called "Justa Cutie" when she was born. We weren't really expecting her when she came and we all fell in love with her the instant she was born. She was a soft grey, mouse color all over and then turned into a beautiful buckskin. Skeeter was born around 6:30 in the evening during Erics 6th birthday. Our entire family got to watch him be born. Born a beautiful golden palomino he has grown into a big stout powerhouse of a horse. Have you attended any rodeo schools? If so, which ones? No, our dad is really good about taking us to the roping pen as much as possible and we get lots of practice working with cattle on the ranch as well. Mom says, "They get to rope and drag calves to the fire for a couple of months in the spring time and there is always doctoring required where Eric usually ropes and Jace loves to be the dogger!" Role models/mentors:Jace: My parents. Eric: My Dad. What do you like to do when you're not competing?Jace: Being in 6th grade this year I got to start playing sports and I have already played football and basketball. Now I have some time off until my favorite sport, wrestling, starts. After wrestling I will run track and start back up rodeoing! During the winter I like to ski and snowmobile. With my family we love to go hunting, so any chance we get we go elk hunting or small game hunting. Eric: When I am not rodeoing I can be found most times on the back of any horse. I like to ride, work cows and train new prospects. If I'm not ranching then I enjoy playing sports and this fall I played JV and varsity football for our school team and now I am playing JV and varsity basketball. I really enjoy wrestling but had to choose this year between basketball and wrestling. Then this spring I will probably run track and try to rodeo when I can until school's out. Like Jace said, I love to hunt as well and ski. So pretty much anything outdoors I enjoy!